Dan Wilbur is my new best friend. He doesn’t exactly know it, but whatever. His blog, BETTER BOOK TITLES is genius. Simple concept, brilliantly funny execution. He takes well-known books and re-titles them so that you, the over-worked reader, don’t have to actually read the whole book to get the gist of things. What a time-saver! 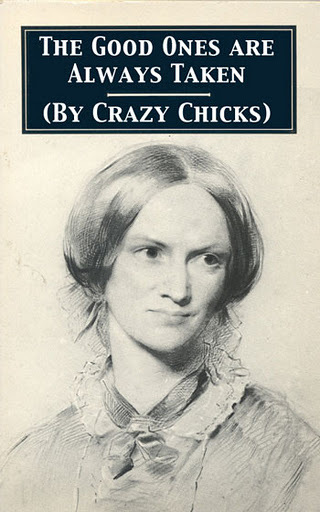 Because I, for one, do not have time to read Jane Eyre again. But a simple glance at Dan’s better book title, and I’m good. Basically, I’ve found a way to fit in at those get-togethers where everyone’s talking about the lastest best-seller (or classic) that I haven’t got ’round to reading yet (implying that someday, I might actually read these best-sellers/classics). And now you can be cool and well-read, too! But I’ve got dibs on Dan Wilbur if he shows up. Krissy Brady is my new friend and she can be yours too. There's a link on my blog. Lots of submission opportunities! Hi Cathy, how are you? I've been so busy, you know, this itme of year. I LOVE Better Book Titles. You're right. It is genius. And fun! Linda, I'll zip over!Vicky and Paige, agreed!